"Now the very blustery night turned into a very rainy night." It was a blust'ry day, all right. I had to go to Fort Madison, Iowa to install two machines for a client. We'd put it off twice now and he finally said, "Rain or no rain, let's get this done." I drove through intermittent rain until Galesburg. Then, it ceased and didn't start again until after I'd had lunch and had to go install crack gauges on one building. The machines were set up without rain, just a steady, raw, 20 mph wind. I thought I was dressed warm enough. I should have worn my winter coat. Damp wind like that will blow through pretty much any layers. It was drizzle all the way home, steady drizzle. It reminded me of that rain you get in late November, when the weather can't decide if it's going to rain, sleet or snow. The wind had been from the southeast when I left but was out of the northeast on the drive home. Getting gas was an adventure. I huddled next to the car, trying to find a spot where the wind was broken. Nope. Of course I didn't bring gloves. I was ever so grateful I'd stopped at Starbucks (Thanks again Patt!) for hot tea. Holding the cup once I got back onto the Interstate along with the heater blowing full steam, warmed me up. I got home right before a line of major storms came through. There was hail; like ice shards or grit; lightning and thunder. I decided the thing to do on this very rainy night was to sit and stitch so Pilchard could take full advantage of the lap. The girls were so happy to see me. I was so happy to see them. So while the house shook with thunder and rattled with rain, I scratched the occasional ear and chin and got another third of the outlining done. 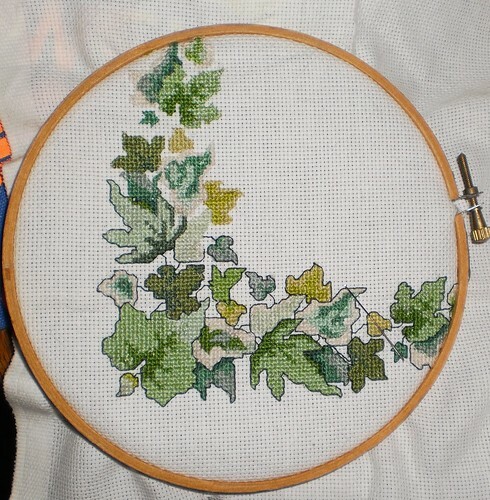 Initially, I had considered leaving the leaves un-outlined. They look almost like a watercolor done in cross-stitch. But, now that I've progressed over half-way, the outlining really makes them stand out. It will probably take 2 more sessions to finish, but it will be done by this weekend. My bed is calling to me. Twelve hours and 500+ miles later, I am ready for a good night's sleep.